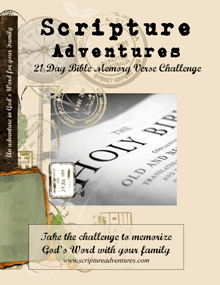 Form a habit of scripture memorization with this 21 Day Bible Memory Verse Challenge! You can check it out at Currclick! You can help establish this habit with your children, and you can work on it as a family! In just five minutes a day, you will help your children memorize, review, and retain important Bible verses that will help them love and live God’s Word. Grab this 21 Day Bible Memory Verse Challenge from Currclick!